The Text Content Editor is used to edit a text node attached to an element. This editor does not operate on attributes. Instead, it is used to edit the text data within elements enclosed within tags like <script>…</script>, <title>…</title> and <text>…</text>. 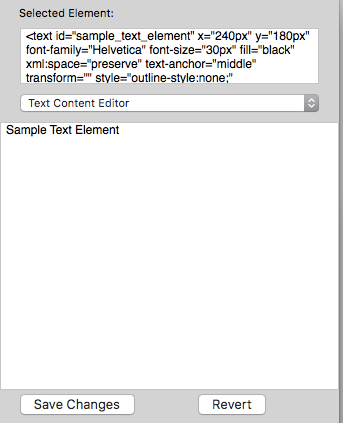 In this example, the text content of a <text> element is displayed in the Text Content Editor. After editing the text, click the “Save Changes” button to update the text data attached to the element.